The convertible's headlights cast two luminous beams through shimmering rain and black night. Ahead, the lights of Graden loomed like a glowing promise. "Five days," Bryce repeated as he drove, hunched forward to scan the darkness ahead. "You serious?" Eddie nodded. "That's what the people from Cavaheim said. Why would they lie?" "Five days until they kill a bunch of people with hot lava. Man, that's sick." "But that's not the scary part. What if the world ends? I mean, that's the whole point, right? Some guy from the dragon rider's city will cast a spell that will end the whole world." "That's crazy," Bryce muttered. He wiped the foggy front windshield with a cloth. "What's not crazy? 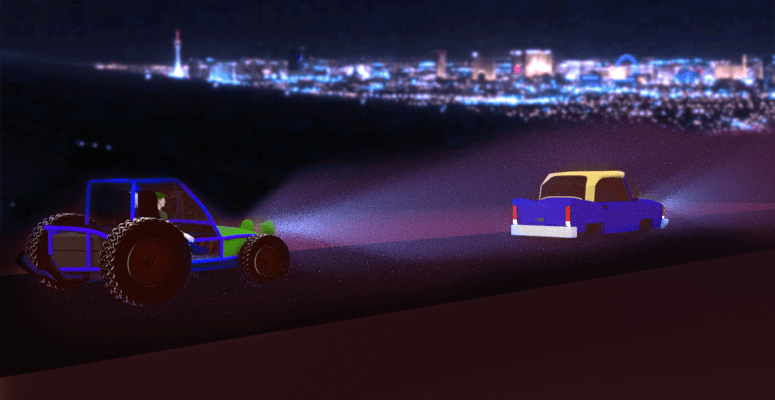 We're in a car that doesn't run out of gas, drinking soda from an infinite soda cooler, with a dragon rider in the trunk and a cyborg following us in a dune buggy from an underground civilization." "Well, what are we supposed to do about Cavaheim?" Eddie leaned back. 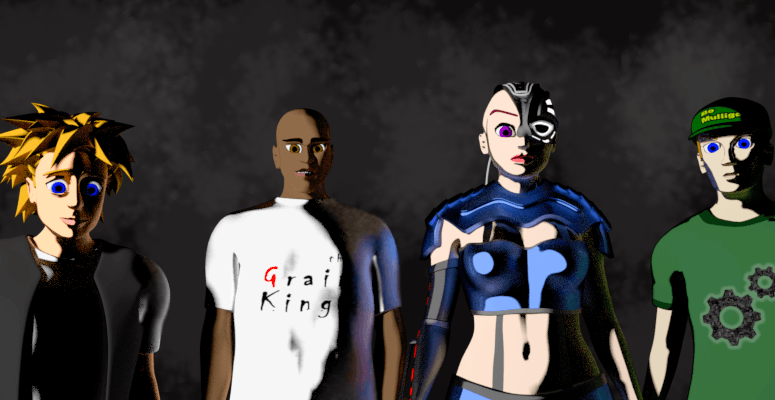 "We tell the people in Graden. That's what we do. There's civilization up ahead. That means someone is in charge and someone else can deal with the danger." Bryce grinned. "Huh! Sounds good. We collect a reward and take a day off. I wonder what the ladies are like in this town." The road, which had started as a broken patchwork of crumbled concrete, graduated to solid black pavement with a yellow line. Ahead, street lights lit the way at regular intervals. "Hallelujah," Bryce said. He gunned the accelerator, checking the rearview to make sure Phyllis and Syd were keeping up. "So, Ruby met up with that woman from the jail in Holcomb." "Why didn't you mention this phone call with Ruby before?" Eddie thought back to everything that had happened down in the turnpike, the masked man Barlow who turned out to be Tim. Eddie had killed him with a touch. His heart chilled at the memory. Bryce turned to him and frowned. "Yeah." They passed a billboard. Its message was in a language foreign to Bryce, but Eddie translated. "Affordable Car Loans with the name you can trust - Snidely Beanbrook Auto Finance." "Ah damn," Bryce laughed. "This really is civilization. I was hoping for something exotic." Eddie pointed. The next billboard featured a woman in a cape and flowing skirt, standing like a magician presenting a trick. 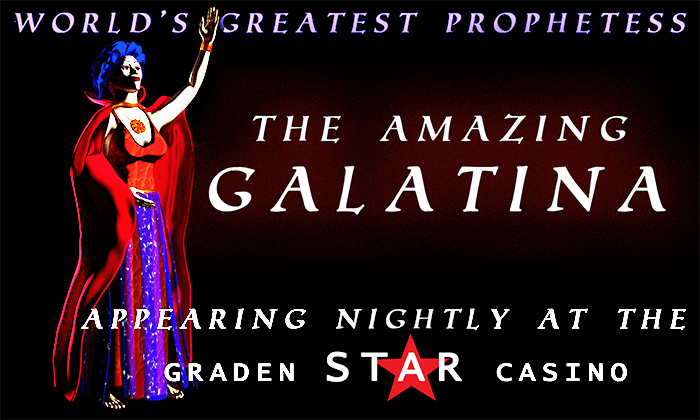 "World's greatest prophetess, the Amazing Galatina - appearing nightly at the Graden Star Casino." "Huh. Prophetess. I guess you'd better steer clear of her or she'll go crazy and piss her pants at the sight of you." The Lamia. The thought of her reminded him of the rock resting in his pocket. It was easy to forget it was there. It didn't burn a hole in his leg or vibrate with power. It didn't feel unclean. It was just a rock. But his promise to the snake woman made him uneasy. She wouldn't have given it to him if it didn't carry some kind of malice. Eddie hadn't told Bryce about the Lamia. He didn't think he ever would. "What's that up ahead?" Bryce muttered, leaning forward. Eddie followed his gaze. The rain had let up to just a sprinkle, and a dark wedge appeared in the shimmering wet asphalt ahead. "I can't tell. It looks like—"
Bryce slammed on the brakes just before they reached it. Eddie recognized their danger. A wide fissure bisected the road up to the shoulder. The car skidded to a stop, inches from the gap. A moment later, the tires of the dune buggy screeched behind them. It turned as it slid, nearly toppling and stopped only a foot from the convertible. Bryce threw his door open and climbed out into the rain. "You guys okay?" "Fine," Phyllis said, a little annoyed. "What's wrong?" Eddie opened his door. He checked Kai. She'd been sleeping. Now she lay on the floor between the seats, rubbing her head. "What happened?" "Sorry, Kai. We almost hit something. Go back to sleep." Eddie, Bryce, Phyllis and Syd stood in a row, staring down into the black gap. 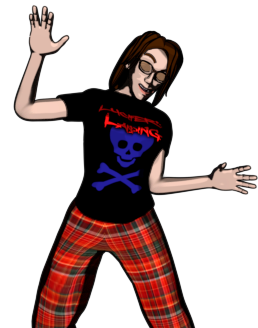 It was twenty feet wide at the right side, tapering off to a point at the left shoulder. "Guess we go around," Bryce said. "If your car could fly—" Eddie began, but a sharp look from Bryce cut him off. "I'm just saying." "That city ahead is huge," Syd said. "Yeah," Bryce agreed. "It's like driving out of the desert into Las Vegas." When Syd looked puzzled, Bryce added, "Another city." They all took in the shimmering lights. Above it all, the huge tower stood glowing gray in reflected light, its beacon swiveling above, winking at them with every rotation. They returned to their vehicles. Bryce led the way, pulling to the left shoulder of the road and rounding the head of the gap. "Guess we won't be driving eighty on this road anymore." They continued along the highway, Eddie and Bryce both silent now. From the back seat, a small gray hand thrust a can of Mountain Sunrise forward. "Open, please." Eddie took the can, popped the lid and handed it back. Kai enjoyed the soda in noisy sips. They passed a house. Its windows broken, its front yard full of weeds. Another house shot by looking equally abandoned. "I hope we don't find that the lights are on but nobody's home," Bryce said. "We haven't passed a single car out here." "Well there's something up there." A mile ahead, blinking yellow lights blocked the road. As they approached, they found a row of jeeps in their way. 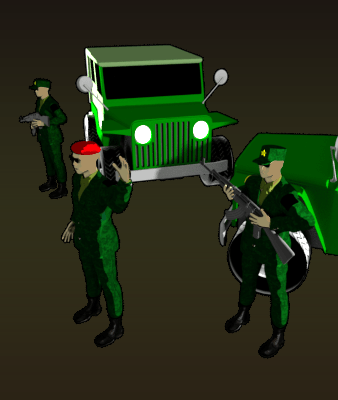 Three men in military green stood just behind a sawhorse barricade, two of them holding automatic rifles across their chests. The unarmed soldier, who wore red beret and a big grin, stepped forward a few paces. "What do we do?" Eddie asked. Bryce slowed. "The one in the middle has a friendly face." "The ones with the guns don't." Bryce stopped the car a couple dozen yards from them. "Hmm." He tapped his fingers on the wheel a few times, then threw his door open. "Hi," he called out to the soldiers. The soldier in the middle smiled and waved. "Hi. Welcome to Graden."